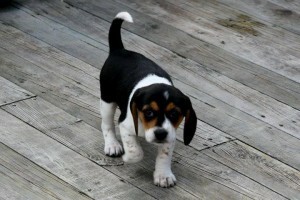 HAPPY ENDING: Home, Safe n' Sound: Lost Dogs: LeMarchant Dr, Kentville, Kings Co., NS — Beagles, Female, 11 Weeks Old — "Echo"
Additional Notes: FEMALES: TWO Beagles 1. Penny: adult wearing a collar, brown and black 2. Echo, 11 weeks old, mainly black and white wearing a camouflage pattern collar. Went missing May25/12 at approx. 3:50 pm.